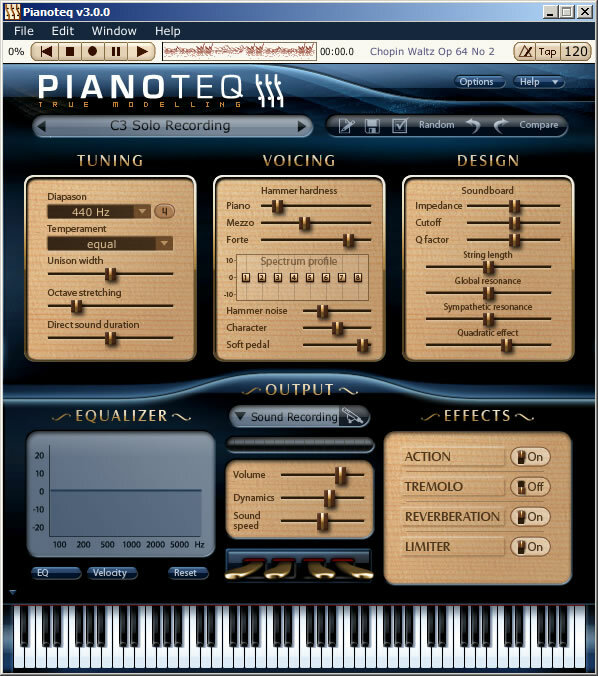 Pianoteq is a modelled piano plug-in. Being a truly modelled piano, the sound is created in real time from scratch through a sophisticated mathematical model, simulating an acoustic piano. It is responding to how the pianist is striking each key and how strings are interacting, just like a real piano does, resulting in an expressive and vivid instrument. The first generation of pianos began with Cristofori's pianoforte in 1698 which came to maturity at the end of the 19 century with the acoustic grand pianos. It was followed in the 20 century by the second generation electro-acoustic pianos and the third generation sampled pianos where each note is a recording of how it sounded during a specific moment in time, not taking into account the complexity of the instrument. According to Modartt, Pianoteq is the first and only piano belonging to the fourth generation, developed in order to go beyond the limitations of the third generation and to become a versatile and innovating tool. Simulating acoustic pianos: Everything that characterizes an acoustic piano is there: the mechanic noises (optional), the complexity of pedals and strings in interaction, the percussion impact on staccato play, and the beauty of the piano sound. New possibilities: The unique adjustable parameters result in great realism and even allow going beyond the material constraints of an acoustic piano, thus being able to create new instruments and sounds. System friendly: Pianoteq adapts dynamically its CPU consumption to the resources available on your computer. Responds in real time to pianist's interpretation. Sounds and behaves just like a real piano. Advanced parameters for tuning, voicing and soundboard adjustment. Small (7 MB) and fast. Enhanced Binaural model for all instruments. Bugfix for AU plugin not being recognized by a few hosts (STAGE version only). Metronome bugfixes (1/1 time signature begin silent, accent on first not being recalled). bugfix for Velocity curve to allow silent notes. Now available as AAX plugin for Pro Tools 11. Bugfix for condition slider saving, now restored in Pianoteq STAGE. Bugfix for a crash in the delay effect. Bugfix for issue where the ASIO sample rate was not correctly restored on startup. Disabled multicore rendering in Pro Tools to avoid freezes. Bugfix for issue with some MIDI-mappings not working on startup. Better diagnostic message when an external impulse response is not available. Improved undo/redo behaviour when a slider is being dragged. The "Disklavier XP" mode enables the recognition of "extended precision" MIDI files recorded on high-end Disklavier pianos, such as the ones available on the international e-piano competition website. The "Hi-res CC#88" mode enables recognition of the MIDI high resolution velocity prefix for note-on and note-off messages, such as the ones sent by the VAX77 MIDI keyboard.